The State Government has welcomed Singapore Airlines’ newest Boeing 787-10 aircraft to Perth as its first Australian destination. The aircraft flew in to Perth Airport for the first time on Monday afternoon. 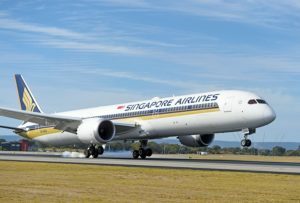 Singapore Airlines is the first to fly the newest Dreamliner, which will allow for a capacity increase of 38,000 seats on the Perth to Singapore route. Singapore is currently the third largest international tourism market for Western Australia by visitor numbers, and fourth largest by visitor spend, with 102,000 Singaporeans visiting WA in 2017, spending $220 million. Perth is the second destination in the world, after Osaka, to welcome the arrival of the newest Dreamliner.